In addition to some front office tasks, Sophia is the face of our social media! We asked her what here plans are for the summer. Let’s see if they inspire you to get into action! The sun and the weather! The older I get, the more my mood is dependent on the weather and waking up to see the sun and having it still be bright around 9pm is the best! What is your favorite outdoor activity to do under the sun? I’m not sure if this counts but I love sitting passenger seat in a car that has the sunroof open. Whether it’s just down the street, to the mall, across town, or on a road trip blasting up the summertime anthems and soaking up some vitamin D, I really enjoy this. Luckily I have some mini excursions this summer that will allow me to stick my hands out of the sunroof and sing! Summertime is also when I bust out my tennis racket. The older I become, the more tennis becomes a summertime hobby for me but I do enjoy getting together with old friends and hitting back and forth. After warming up things get a bit competitive and we always play for some sort of summer treat. I don’t know why I continue to do this because I always lose but it’s all in the game! To be completely honest, anything goes so long as I’m soaking up some rays and by a body of water. I can be as active as playing sports or as relaxed as sitting on the grass. Either or, I just love feeling the warmth on my skin. Do you have any recipes you particularly like to make during the summer? I really enjoy making bruschetta because it’s light and refreshing but I adapted that recipe to make a summer pasta! I eyeball everything so make it to your taste! I grab a carton or two of grape tomatoes and cut them into quarters or sixths. To that I add coarse salt, balsamic vinegar, olive oil, minced garlic, basil, cut up pieces of mozzarella cheese from the ball, and pieces of prosciutto. I toss all of that in with penne and it’s nice to enjoy warm but also pleasant to eat cool. Since we’re dealing with pasta, I don’t use as much balsamic vinegar as I would use if I was just making bruschetta. I’m enrolled in two courses this summer: anatomy & physiology 2 and statistics so this summer I just plan to study…. BUT hopefully I manage to organize my time well because I have a lot of things I want to do this summer! The thing I’m looking forward to the most is traveling. I went to Vancouver, Canada the weekend of July 4th and plan on traveling back there as well as Portland and Las Vegas in late August/early September once my summer classes are over! My favorite thing to do while traveling is to EAT! There are so many good places to eat around Richmond and Vancouver BC. 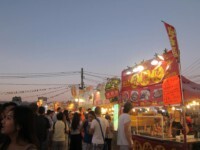 During the summer I recommend visiting Richmond Night Market to indulge in street meals and snacks from Taiwan, China, Korea, and Japan. There are also many merchandise vendors selling trinkets from those countries as well! While I’m there I always buy korean socks, rotatoes, mango shave ice, milk or boba tea and takoyaki while looking for new things to try! Aside from that, dimsum is really delicious. You can check out Continental Seafood Restaurant in Richmond or Kirin Restaurant and Sum Sui Wah in Vancouver. If you enjoy roast duck and bbq pork, Master Hung’s does a fantastic job. I really enjoy Asian desserts as well so if you’re looking for milk tea, egg waffles, or nice cold treats, check out The BubbleTea Shop or 720 Sweets! In Portland there’s so much things I want to try! Tea Bar for boba, The Screen Door for chicken and waffles, Saburo’s for sushi, and Blue Star Donuts just to name a few. Other than eating I’m not too such what else to do. I’ve been there a few times for dragon boat race festivals on the Tom McCall Waterfront Park. On a nice, sunny day, that would be a great place to take walk or bring your lunch for a picnic! I am trying to fit in at least two hikes this summer. I want to hike Rattlesnake first and second, either Blanca Lake or Lake Serene because I really want to take a dip in the water! But also because I think hikes are adventurous, rewarding, and beautiful. I really enjoy taking pictures and would love to capture some shots along the way. What is your goal this summer? How might you obtain it? My goal is to get back into a healthy lifestyle. When you work about 40 hours a week and take evening and online classes, you’re really pressed for time. My goal is to go to the gym and weight train 2-3 times a week, meal prep more often because lately I keep buying takeout, and still manage to get at least 6 hours of sleep when I’m not studying. I’m no health nut but I feel at my best and focused when I treat my body well. When you have so little time it’s so easy to grab a meal on the way home so you don’t cook or not go to the gym because you have an assignment due. So in order to obtain this goal, I need to compromise my social life, manage my time well, and make sure what is priority takes precedence before everything else. What would you recommend doing this summer based on previous experiences? Being in the beautiful PNW I recommend going on hikes, traveling to Canada, relaxing at parks, and really, I mean REALLY, just utilizing the sun. Late spring when it was warm and sunny out, I would go to Greenlake with my boyfriend to just sit on the grass and talk. I think any time outside of the house and in the sun is time well spent. Summers in Seattle are so beautiful and we really know how to appreciate it but it’s really easy to be a couch potato when it’s too hot and watch your favorite tv shows. So maximize your time outside, travel when you can.. Seize the day! Carpe diem! !